The years can go by so fast.... 2012 was no exception. Thinking about the blessings and challenges that whirled around within the past 12 months makes for some introspective moments on this last day of the year. Hello 2013, glad to meet you head on and with a grateful heart for all the family and friends in my life. 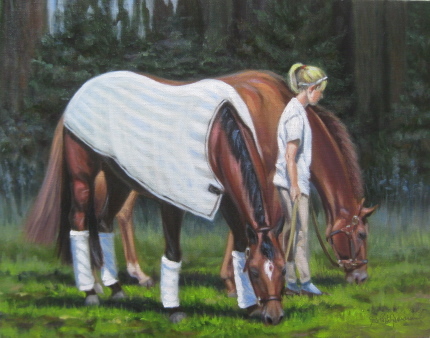 Posted here is my latest portrait of a wonderful woman with her Tennessee Walker and Australian Shepherd. She has rescued and worked tirelessly for the welfare of abused horses in our state and surrounding counties. You couldn't find a person with a bigger heart. My favorite thing about doing portraits is meeting people and getting to know them through the process. It was an honor to paint this for her. It was the last portrait commission that I completed for the year. More on all that as the months start rolling by! So for now..... Happy New Year ! 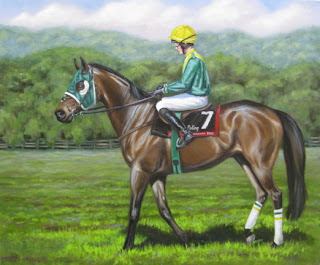 To fill my promise to post some of the paintings that were at Belle Meade Plantation this summer, here is "TAX RULING" ( with Darren Nagle in the irons ). This painting was inspired by Tax Ruling's first win at the 2010 Iroquois Steeplechase. The size is 20 x 24. Tax Ruling also won the Iroquois in 2011. In 2010 it was a sunny beautiful day and the light brought out the warmer tones in this beautiful horse's coat. On cloudier days he appears a much darker bay color....stunning either way ! Mr. Irv Naylor is the owner of this impressive horse among many other successful horses in the steeplechase world. 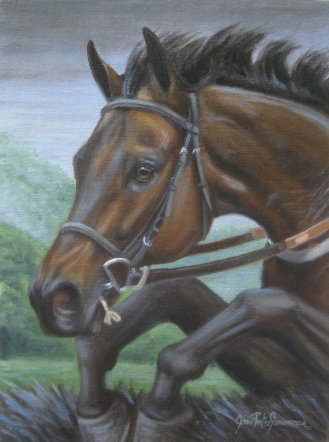 I also painted "Chess Board", another of Mr. Naylor's horses for last year's solo show. 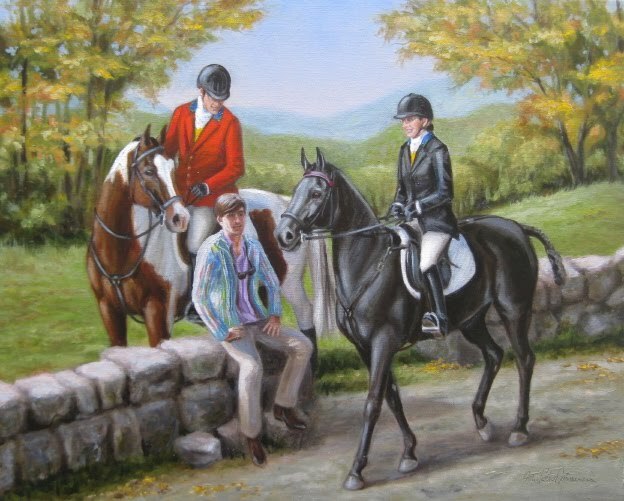 Mr. Naylor's story is inspiring to say the least and if you'd like to read more about this amazing man, here's a link to a story written about him in the "Pennsylvania Equestrian" by Terry Conway in 2011. The second shot here is a look at the space at the Belle Meade Art Gallery in the Visitor's center just before the show opened this June. I've been informed that I have another spot for my 4th solo show there in 2013....needless to say, I was very happy with that news! 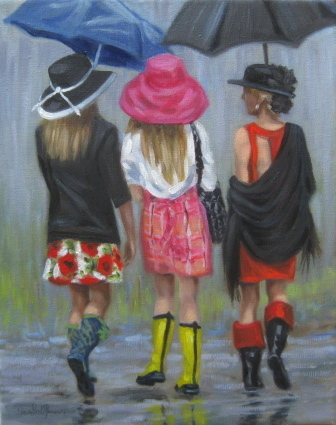 Here's another painting that was new this year at the Belle Meade show. 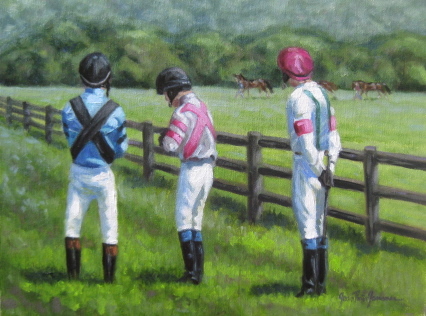 "Jump Jocks" is an 11 x 14 oil painting of steeplechase jockeys waiting for their horses to arrive for the next race at the Percy Warner Park steeplechase grounds in Nashville. I am constantly amazed at the particular athleticism and talent that the jockeys must have to compete in this sport. I recently completed this painting for a lovely family near Knoxville, TN. 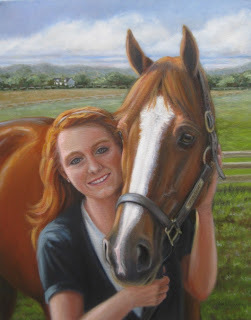 We connected at the Webb School Art show (Artxtravaganza) and they commissioned me to do a portrait of their daughter and her horse. It was a joy to paint. A fun aspect was painting Taylor’s red hair and Tig’s chestnut coat. What a great match they make! It warms my heart to see a former racehorse successfully transition to another home and career and best yet, live with a family that loves him so much. With the support of her parents, Taylor trains and works hard with her instructor to bring Tig along showing in the Jr. Hunter division. This is a commissioned painting that I completed toward the end of 2011. This lovely family wanted to be reminded of happy times with their son on hunt days and riding through the the hills of Tennessee. Our goal was to bring them happy memories of those days spent together. According to the client...mission accomplished....in her words...." I absolutely love it..... You not only got the physical appearance but much more the spirit."